Find out how I published my child’s story to help others in a similar situation, pay tribute to him, and raise awareness. SellUsYourStory.com provide a free service to help get your stories published for the highest fee possible. Would you like to tell the story of your son or daughter? Have they been through something heartbreaking, inspired others, or perhaps something uplifting. If you’ve been thinking ‘I want to publish my child’s story’ to help others in a similar situation, or provide a tribute to them, we’re here to help. If you have a story you’d like to share get in touch with us today. SellUsYourStory.com provides a free service to get your story told, and get you the highest payment possible (for you, your child, or a charity of your choice). One of our friendly reporters will be happy to explain the process and answer any questions you might have – with no obligation for you to go ahead. We love helping people share what they have been through with the media – be it newspapers, TV and/or women’s magazines – whilst securing them the best possible fee and coverage. We find interviewees are often able to help other people who may be going through a similar situation or they are able to raise awareness for a particular cause or charity. Tell my child’s story now: Simply tell us a little about his or her story. Fill out the Story Valuation form on this page. We’ll let you know if we can help you, and how much your story is worth. We recently helped Terri Lewsley share her heartwarming story about her son, Taylor, learning to walk on his new prosthetic legs. 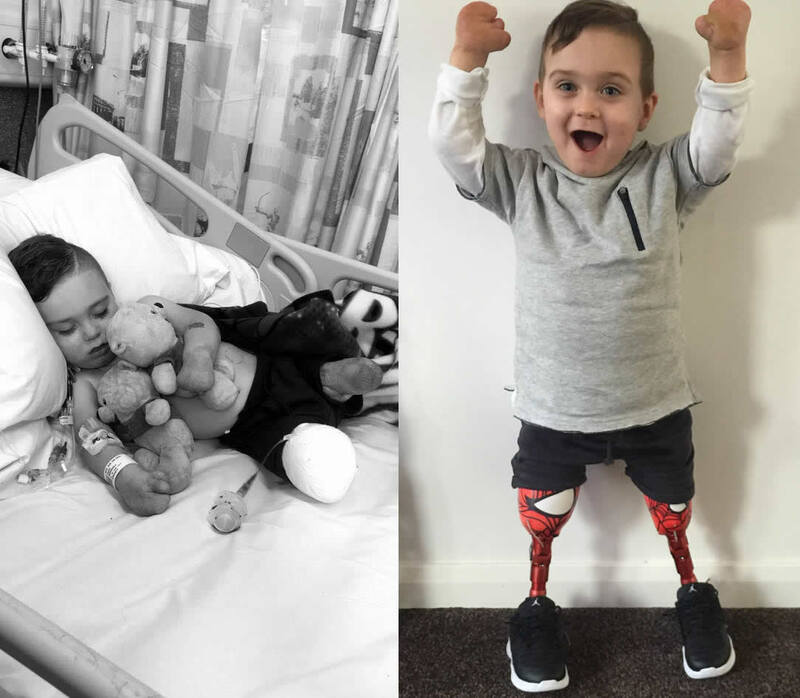 After losing his limbs to meningitis as a baby, Terri was overwhelmed at how quickly three-year-old Taylor took his first unaided steps. We arranged for Taylor’s story to be sent out on our news wire – which means it was sent directly to all of the national newspapers – and for it to also appear in two weekly women’s magazines – Best Magazine and Real People magazine. Peaking over the cot, my heart just melted. “He’s so perfect,” I said, stroking my little boy’s rosy cheeks. I couldn’t believe my son, Taylor, was nearly eight months old. “He’s growing up so fast, isn’t he?” my mum, Kate, smiled, over my shoulder. I leaned in closer and gave him a big kiss, just in time to catch his tiny, toothy grin. Taylor had always been such a happy, cheeky little boy. It certainly was a surprise to find out at the age 22 that I was pregnant with him. Everything went swimmingly until he was due. Suddenly he stopped moving so doctors needed to induce me. Luckily, everything was fine, it was just Taylor keeping me on my toes. The next evening, I woke-up to the sounds of him stirring from down the hall. Bleary-eyed, I wondered to his bedroom to find out what was wrong. “Mummy’s here,” I cooed, leaning his cot to pick him. Giving him a cuddle, I instantly noticed that something wasn’t right. He had a raging temperature and his skin was burning to the touch. Suddenly, Taylor vomited all over himself, and the shock sent him squealing again. “On no, it’s OK, you’re OK ,” I soothed, slightly panicking as I remembered I lost the thermometer. Trying to stay calm, I nipped next door to borrow one from our neighbour, and called 111 as soon as I realised his temperature was off the charts. “Don’t worry Miss Lewsley, we’ll send an ambulance to be safe,” said the operator in a calming tone. I nervously sat next to Taylor’s hospital bed in A&E as doctors gave him the once over. “Is he OK, what happened?” my mum said, pulling back the hospital curtain. “He’s seems fine,” I said, still not quite convinced he was. “Just gave us a bit of a shock, didn’t you?” the nurse smiled towards Taylor. He’d already perked-up, flashing a cheeky grin back at her. The doctor ran a few tests and decided it was safe for us to take him home, so we headed back to my mum’s for the evening. Watching mum bounce Taylor on her knee, I took a bite of my sandwich, and deep down, I knew something didn’t feel right. Suddenly, Taylor was sick, but this time he didn’t cry, he just fell silent. “Is he OK?” I said, jumping up from my dinner plate. I looked on in horror as thin blue lines spread across his cheeks – he looked like a slice of Stilton cheese. “Quick! Call an ambulance,” mum screamed. “What?” I managed to whimper, before mum and I both burst into floods of tears. It felt as though my mum role had been ripped from me, all I could do was wait, and hope my little boy pulled through. The next few hours were crucial. We prepared for the worst, inviting all of our friends and family around to the ward to say their goodbyes – we even got Taylor christened. Despite the warning, my little boy kept on fighting, and he spent the next 17 days in a coma. “I’m sorry but the sepsis Taylor has contracted means we’ll need to amputate his right leg,” explained the doctor. I cradled his face in my hands, gave him a kiss, and he was carted off to surgery. “He’s alive, and that’s the main thing,” I said to mum. He was put back into a coma for another week, and the following week, he needed all fingers and thumbs, as well as his remaining toes, removed. Some days felt like we were taking one-step forward and two steps back. “You’re still my little superhero,” I said, reading him his favourite book while sat on the ward. Finally, in November 2015, seven months after he was first admitted, Taylor was released from hospital. “Welcome home,” I gleamed, clutching him in my arms as we walked through the front door. Over the next year, we started to get back on track. I left my job as an inventory clerk to take care of Taylor full-time. He was given a prosthetic leg and a splint to support his remaining one. He had learnt to stand, climb stairs, he’d even managed to ride a four-wheel bike. Taylor also had reconstructive surgery on his hands and doctors managed to use his knuckles to fashion a finger and thumb pincer. “Is he getting used to picking things up?” mum asked, sipping her cup of tea. “Yeah, he’s doing well,” I said. “I’m a little concerned about his right leg though, it doesn’t look like it’s growing.” Mum’s face mirrored mine with concern. We took Taylor into hospital for a check-up in January 2017. “It appears the sepsis has damaged the growth plates in his knee,” the doctor explained, pointing at the Taylor’s X-Ray. Over the next few months, Taylor continued to struggle on his leg, I could see my little boy was in pain. Doctor’s made the decision to amputate his other leg in September. After the operation, I sat by his side, and clutched his little hand in mine. His eye began to squint and then finally opened. “Mummy,” he groaned. “It’s OK sweetie, I’m here,” I said. “Mummy, where’s my leg gone?” he cried. I wished so badly in that moment, that I could swap places with him. “I love you, it’ll be OK,” I said, trying to hold back the tears. The nurse came in and helped me change his nappy, I couldn’t bring myself to look at his leg. When he lost his first leg, he was too young to understand what was happening. But this time, he knew what was going on, and it made it so much harder. A week later, Taylor was back to our home Derbyshire and it didn’t take long for my little superhero to bounce back. He was still struggling to use his legs. “They’re rubbish,” he yelled in defiance, climbing the stairs on his stumps. He tore into the package to reveal a pair of bright red prosthetic legs, emblazoned with his favourite superhero. “Spiderman!” he squealed as his face lit up. It was still tricky to get him practicing in them. Toddlers do love a tantrum. “I can’t do it,” he’d say repeatedly. But Tuesdays and Thursdays were ‘prosthetic days’ for Taylor at nursery. I was out shopping with mum when I felt a buzz from my pocket. It was Taylor’s teacher Ruth, she’d sent me a video of Taylor trying out his new legs. “You can do it, well done, you’re doing it!” she said, calling him over with arms open. I held my breath as Taylor released his fingers from the cupboard and started walking unaided. A smile beamed across my face and I burst into tears. “Why are you crying in the middle of the shop?” mum exclaimed. “Come look, he’s amazing!” I cried, holding the phone towards her proudly. Ruth said he’d be watching the other children walking and wanted to join in. Now Taylor’s a happy, lively three-year-old boy, who has dreams of joining a wheelchair rugby team. Although we’re still taking it each day at a time, I’m so proud of him. He’s growing stronger and faster each day, just like the superhero he is. We deal with all kinds of stories, every single day, so you can be assured you’re in safe hands. So if you’ve got a story to share, please get in touch with us today. You can write into us using our Story Valuation Form or you can call us on 0117 906 6505.